One of the first questions that every Startup Team (as well as every business, period) should ask themselves upon beginning their journey as a Startup: "What does success look like?" Defining what each team member sees as a successful goal for 2 - 5 years down the road not only serves as a beacon on the horizon for everyone to aim for, but as a motivating force that lets everyone know: we're thinking big. An idea is just an idea, but when combined with a base of customers and a source of revenue, that idea is suddenly transformed into a true business. After all, the definition of a business is that which provides value to a group of customers and makes money at the same time. Often an afterthought for startups and entrepreneurs, building a viable platform for business would be one sign that we did our startup right. Yelp, FourSquare, city-specific websites - there are many places and platforms for Urban Explorers to go to find information that will help them discover their city. But when it comes to Search, there is really only one thing you need: Google. 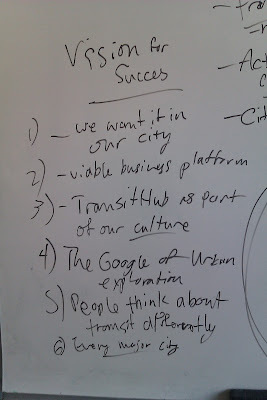 TransitHub would be a resounding success if it became the go-to tool for exploring and sharing insights about your city. There are a lot of transit-lovers out there, no doubt - TTC buttons and station design adoration prove that. But there are also a lot of transit haters - people who despise the sorry state of their transit system and would be more than happy to use any other mode of transport. 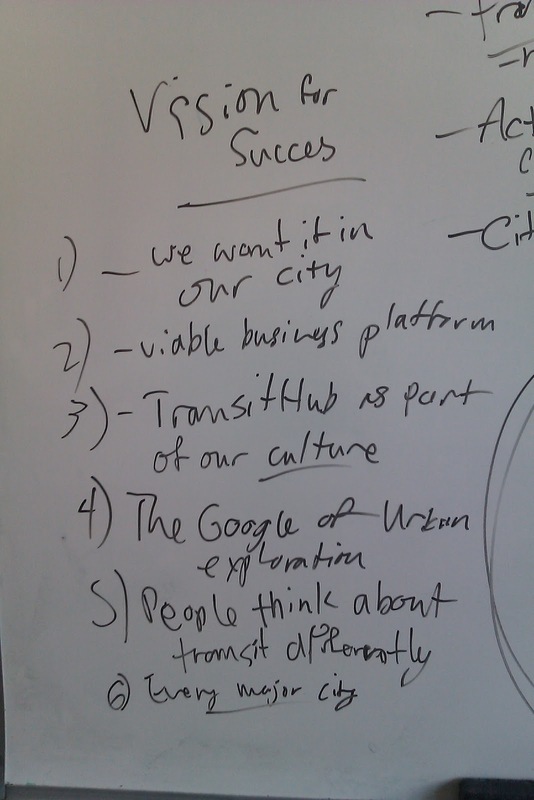 TransitHub would be a hands-down social-success if it helps "take the 'h' out of transit" and inspires people to look to their transit system as the gateway to discovering their city! What do you think of our big-picture "Vision for Success"? Is there anything we missed? Anything you feel we should add? Share your comments below and let us know!